5.68L Flip Top Container. Scoop NOT Included. Acrylic candy container is 5.68L, providing plenty of room to hold sweets, nuts, & more! Purchase 5oz clear plastic scoop here, to remove food easily! 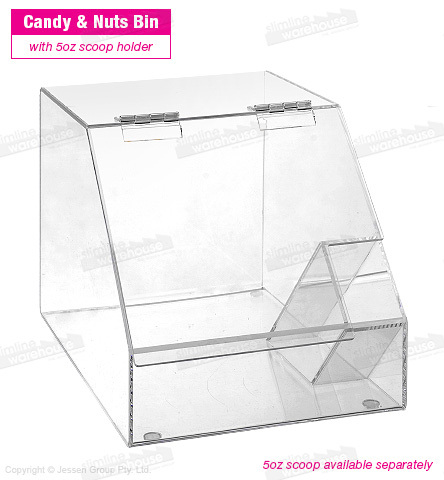 This acrylic candy container helps you stock your buffet or sweet shop with lollies, nuts, & more in a hygienic bin. The plastic buffet bins hold up to 5.68L, providing heaps to customers at your location all in one place. Thanks to the built-in pocket, you can store a small plastic scoop with the container! We recommend our 5oz scoop to go with this display. This countertop display unit as rubber feet a well to protect surfaces it is placed on. The acrylic candy container, like all of our bulk food displays, is made of food grade materials to ensure nothing is contaminated whilst in storage. The clear plastic lets customers see what is available from all sides. A hinged lid helps protect the interior of the bin as well, with easy access by simply lifting the lid up and letting it rest on top of the holder. A cut-out in the lid ensures continuous access to the scoop holder as well. Check out our whole range of food products to help outfit your business with everything you need to provide items to customers!